The Abruzzo region is a remote region often overlooked by tourists. It has spectacular natural scenery, medieval castles and villages, monasteries, and Roman ruins. Two-thirds of the Abruzzo's land is mountainous with the rest being hills and coast. A third of the region is designated as national or regional parkland. Bordering regions are le Marche to the north, Lazio to the west, Molise to the south, and the Adriatic Sea to the east. Main train lines run along the coast and from Rome to Pescara, stopping in Avezzano and Sulmona. Many buses run between large cities and from cities to small villages so it's possible to reach many places by bus although schedules are not always very convenient for tourists. Since much of the Abruzzo is rural or scenic parkland, the best way to really explore the area is with a car. You can see user rated and reviewed Abruzzo hotels on Venere, an excellent site for booking hotels in Italy. If you're heading to the sea, check Abruzzo and Molise Coast Hotels. One option is Monastero Fortezza di Santo Spirito, a restored 13th century fortress monastery in a beautiful setting on a hill, 17 kilometers (about 11 miles) southeast of L'Aquila a few miles from the Grotte di Stiffe Caverns. In Santo Stefano, you can stay in the Sextantio Abergo Diffuso with traditionally furnished rooms scattered throughout the village. Much of the Abruzzo region is in national or regional parks. Parco Nazionale d'Abruzzo is a large protected area with good hiking and biking trails. Its seven visitor centers have trail maps and information. Guided tours can be arranged in Pescasseroli. Gran Sasso, the highest point in the Apennine Mountains, has hiking trails, spring wildflowers, and winter skiing. See Abruzzo - Beauty and Nature in Italy's Backcountry. The region is dotted with castles, mainly built in the middle ages. While some are just ruins, there are also preserved castles and watchtowers. Pescasseroli is situated in a wide plain surrounded by a mountainous landscape in the heart of the Abruzzo National Park. Because of its location,Pescasseroli is a tourist resort in both summer for hiking and winter for skiing and ice skating. The area has been inhabited since prehistoric times and was a center of woodworking and sheep raising for centuries. Pescasseroli has ruins of a 13th century castle, churches, and a natural history museum. To arrive by public transportation take a train to Avezzano and then a bus to Pascasseroli. L'Aquila, the capital of the Abruzzo region, is a medieval town dating from 1240 in a pretty setting. L'Aquila has a good walled historic center with narrow streets and nice squares. The church of San Bernardino di Siena is a beautiful Renaissance church. Santa Maria di Collemaggio has a pink and white facade, 14th-century mosaics, and a Gothic interior. L'Aquila's well-preserved 16th-century castle houses the National Museum of the Abruzzo. Also see the famous Fountain of 99 Spigots, representing the unification of the 99 castles surrounding L'Aquila. Sulmona is situated at the confluence of two rivers below the mountains. Sulmona conserves much of its medieval past such as its Cathedral, several churches, its architecture, and a medieval gate and aquaduct. There are also a number of Renaissance buildings, a good musuem of antiquity, and cultural events. Sulmona has a large, round piazza where locals and tourists enjoy drinks outdoors. Sulmona is famous for its confetti candy, sugared almonds made into floral shapes, and you'll see it in Sulmona's shops. Wool goods from Sulmona are also famous. Sulmona makes a good base for exploring the region. Pescara, on the Adriatic coast, is the largest city in the Abruzzo region. Although it was badly bombed during the war, it's now a good example of a modern Italian city and still retains some historic elements. Pescara has a nice seaside promenade, 20 km of sandy beach, great seafood restaurants, and lots of nightlife. The Museum of the Abruzzi People has a huge collection of artifacts about life in the Abruzzo from prehistoric times through the 19th century. Pescara has a few other museums and several good churches and buildings, too. In July, Pescara holds an international jazz festival. Teramo, founded in pre-Roman times, has buildings from the 19th and 20th centuries. Teramo has a Roman theater that is still used today for sports and cultural events and other Roman remains. There's also a cathedral built in 1158 and several museums. Castelli, a small village beautifully situated between two rivers below the mountains, is famous for its ceramics and has an Art Institute and Ceramics Museum. Several of Castelli's churches have beautiful ceramic works. It's also a starting point for climbing the eastern Gran Sasso. Chieti sits between the coast and the mountains. Its high belltower can be seen in the distance. Chieti has both Roman and medieval remains, the best archeology museum in the region, a good art museum, and interesting churches. Fontecchio is a medieval walled village with a castle in Sirente-Velino Natural Park. Its tower has one of the oldest clocks in Italy. Another attraction is the Church of San Francesco. In summer Fontecchio holds an art and culture festival. Avezzano, about halfway between Rome and L'Aquila, is known for the unique flavor of its potatoes. Avezzano was completely rebuilt after the 1915 earthquake and has a good museum with local Roman artifacts. Nearby are the Alba Fucens Roman ruins, Orsini Castle, and Mount Velino. Cocullo is known for its exciting May festival, the procession of the serpents. Cocullo is a small medieval village with a Piccolomini Castle. Scanno, a medieval hill town surrounded by mountains, has fantastic views. Scanno is famous for its gold works and traditional costumes, sometimes still worn today. 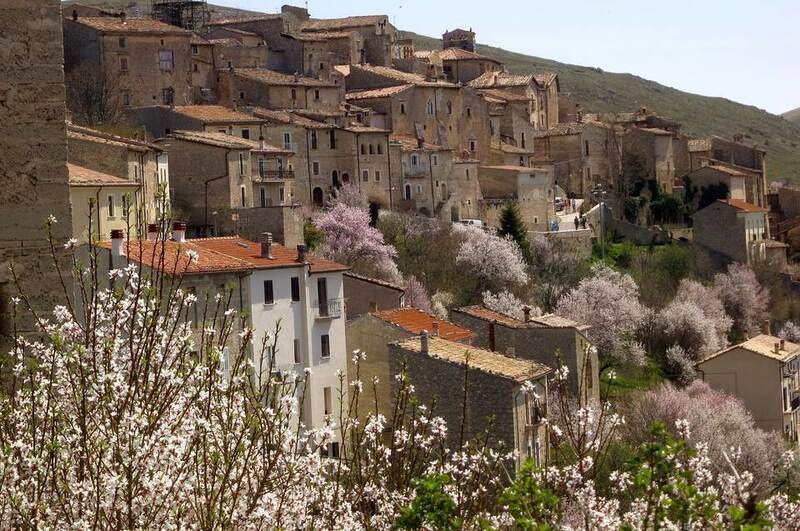 Santo Stefano di Sessanio is a beautiful hill town in the Gran Sasso National Park. Carpineto, also called Carpineto Sinello, is crowned by its castle and has some archaeological ruins. On the last weekend of July, Carpineto holds the Sagra della Porchetta, with tastings of porchetta and ventricina, music and dancing. Villa Santa Maria is called the City of Cooks because of its culinary institute, La Scuola Alberghiera, that's produced many famous chefs. Villa Santa Maria is on the slope of Monte Vecchio and has a well-preserved palace with 18th-century furnishings, open to the public. Grotte di Stiffe has beautiful caverns and even a waterfall inside the caves. There are many charming small villages and they celebrate many traditional festivals throughout the year. Abruzzo's food is based on peasant dishes. Lamb is very popular inland. Pecorino (lamb's milk) and goat's milk cheeses are produced. Pork is also used frequently and on the coast there are many fish dishes. Baked scamorza cheese is a common dish that can be a main course or appetizer. Saffron is used frequently.